30 August 2017, New Delhi: Indian railway, in some sense is India’s true national carrier. As vast a network it has and as the huge number of people it employs, Indian railways has seen its share of ups and downs in the last 3 years under the NDA government. 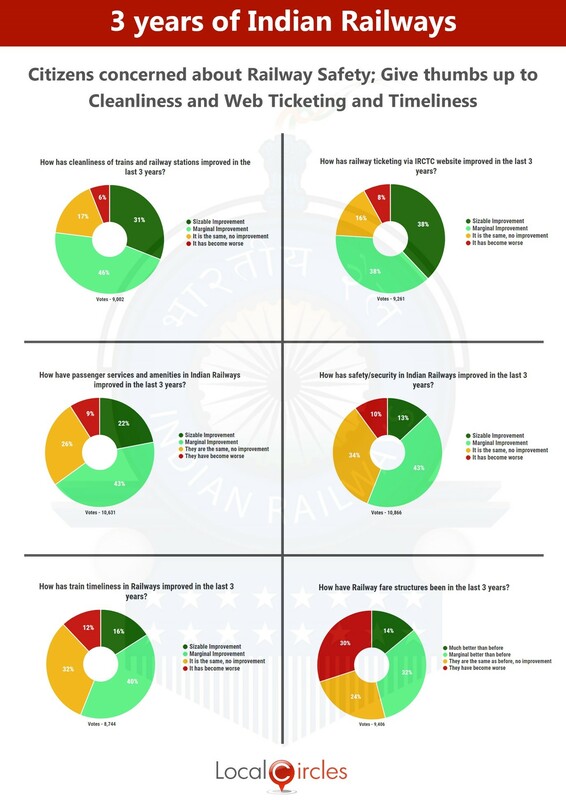 LocalCircles conducted a detailed survey to ask people how they think India’s largest employer has done under the leadership of the present government. People have said that IRCTC website had had major improvements and booking tickets online has become pretty easy now. The trains have become cleaner and better amenities are now available on the stations. Other decisions like increasing the speed of the trains, introducing high speed trains like Tejas and the proposed bullet trains have caught people’s fancies. 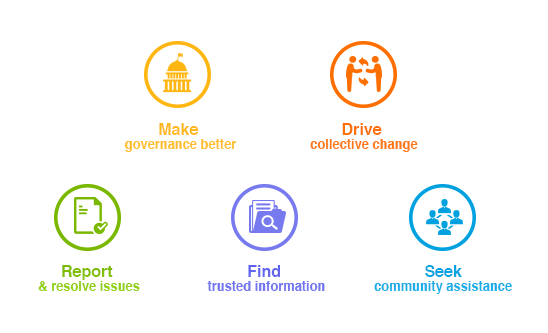 Earlier this year during the rail budget exercise, 47% citizens on LocalCircles wanted safety to be the top priority for railways. But with the recent spate of accidents, it has clearly not been the case. Safety is still a big concern with the citizens as many rail accidents have happened in the last 3 years and accident warning devices have still not been installed in all trains. 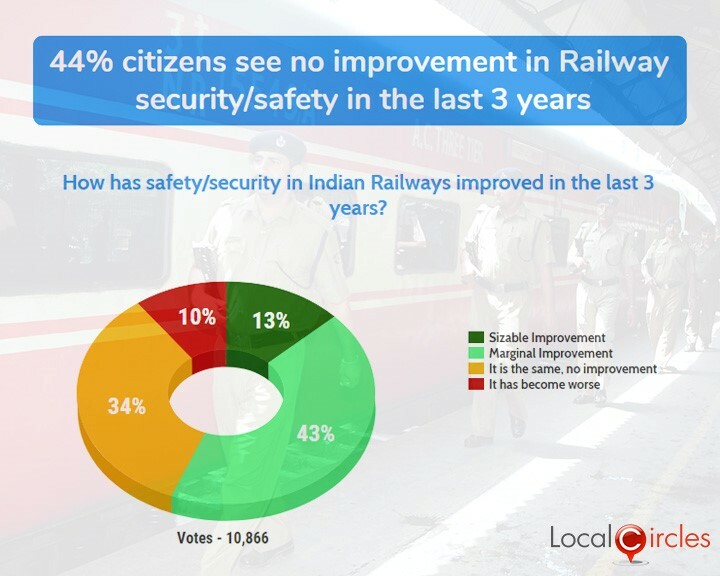 The first poll showed that 44% citizens believe there have been no improvements in safety and security in Indian railways in the last 3 years while 43% believe there has been a marginal improvement. 10,866 votes came in on this question. To reduce accidents, citizens suggested that anti-collision devices be installed in all trains and budgets for buying track testing equipment should be increased. They also pointed out that many coaches are as much as 30 years old and should be retired and replaced with modern steel/aluminium ones. They also said that baggage limitations should be put in place for each passenger and all unmanned crossings should be made automatic with the help of sensors. People have been quite unhappy with the increase in railway fares and have felt a pinch in their pockets. 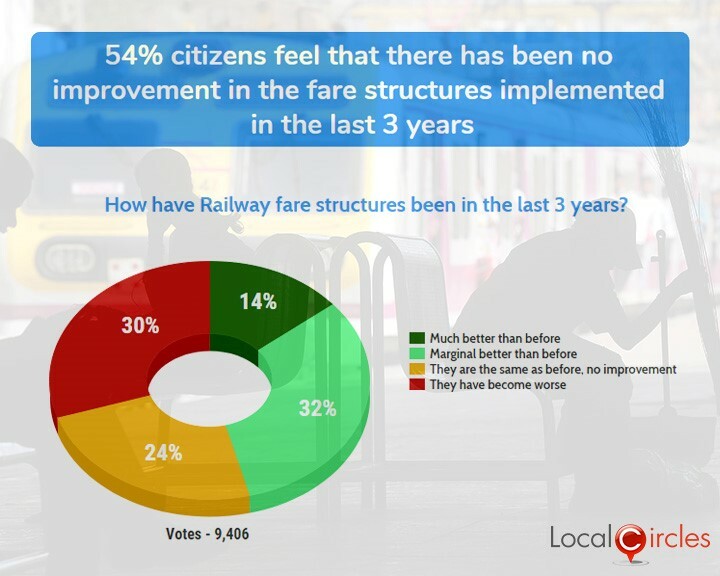 In the second poll 30% said that fare structures implemented in the last 3 years they have become worse and 24% said they are same as before. 14% said that the fare structures now are much better while 32% said they were marginally better than before. This poll received 9,406 votes. The move of introducing flexi-fare did not gain much popularity with the citizens as it increased the ticket price of trains like Shatabdi and Rajdhani quite steeply. 73% citizens in an earlier poll had explicitly stated that they would rather have flat fare increase than the current flexi fare system. 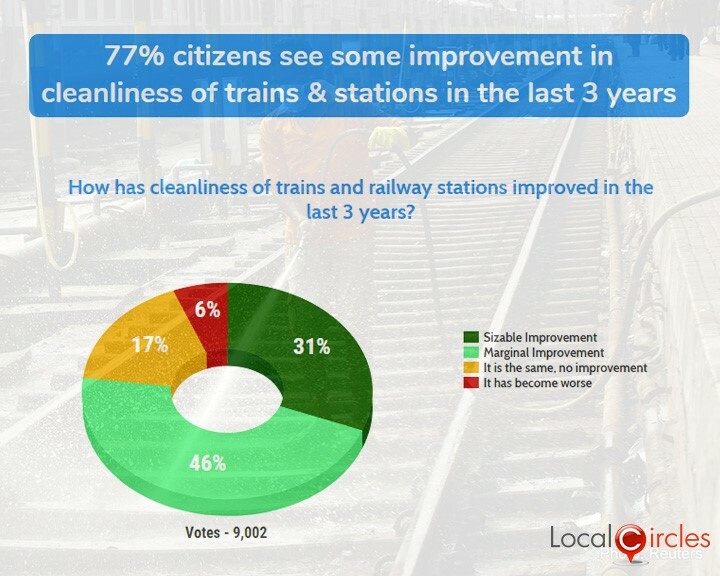 In the third poll, LocalCircles asked people how the cleanliness of trains and railway stations improved in the last 3 years. 31% said the improvement was sizable, 46% said it was marginal, 17% said there has been no improvement and 6% said cleanliness had gotten worse. 9,002 people voted on this poll. To improve the cleanliness further, people suggested that railwas automates the cleaning process whereever possible. They also said that the cleaning staff should be well supervised and food vendors on platforms should be trained on hygiene and safety practices. More dustbins should also be installed inside trains and on stations. 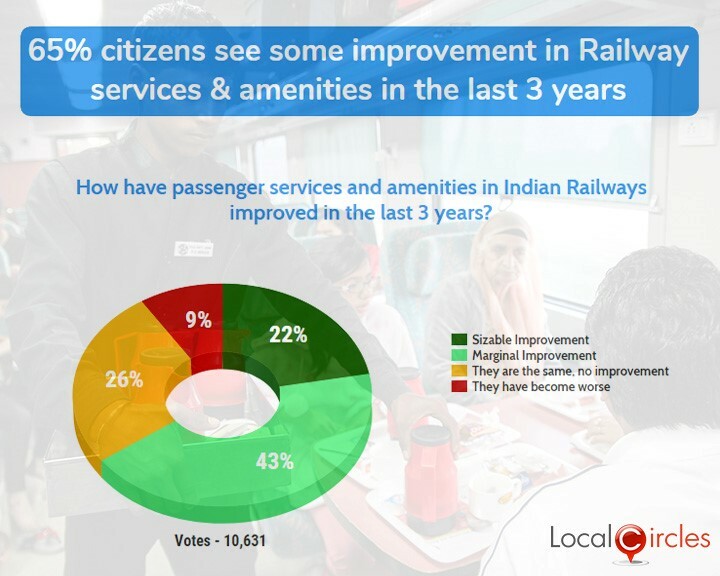 The fourth poll saw 43% citizens voting in favour of sizably improved passenger services & amenities in the last 3 years with 43% saying improvements have been marginal. 26% said there were no improvements and 9% said they have become worse. 10,631 citizens took part in this poll. When it came to services & amenities, people wanted the quality and hygiene levels of food served in trains should be improved. They wanted the train toilet accessories to be effectively maintained and hassle fee coolie services should be provided. People also said that free wifi should be made available on all platforms and effectiveness of phone helplines and their information quality must be refined. 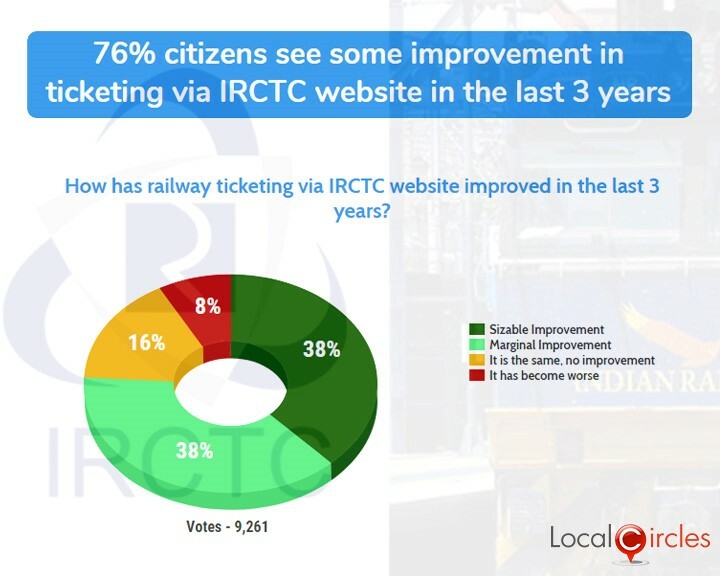 When asked how has the ticketing via IRCTC website improved in the last 3 years, 38% of the 9,261 participants said the improvements have been sizable and another 38% said improvent has been marginal. Only 16% said that there were no improvements and 8% said it had become worse. People complemented the authorities on the vast improvement in the IRCTC site functioning and the ticket booking process becoming easier. The biggest ask people had in this case was the ability to pick seats while booking on the IRCTC website. Introducing the onward booking facility also came in as a key input. 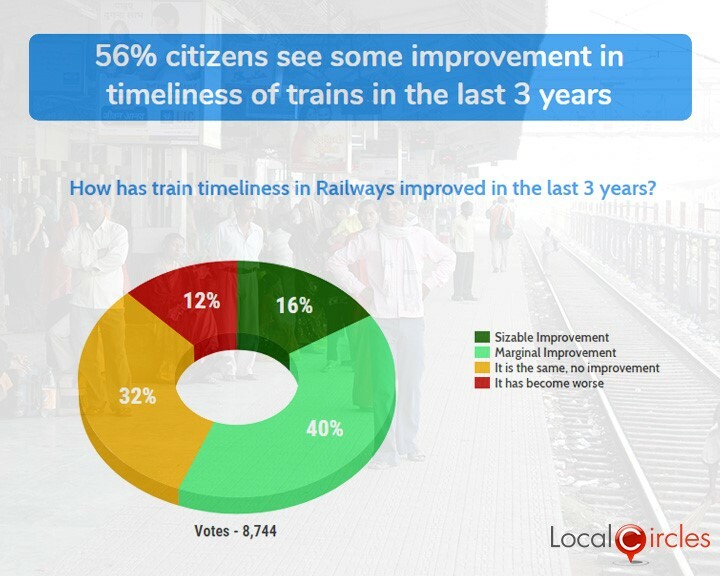 In the last poll, 16% people said there has been a sizable improvement in the timeliness of the trains in the last 3 years and 40% said that the improvements have been marginal. 32% said there has been no improvement and 12% said the situation has become worse. A total of 8,744 votes were polled on this question. Reducing train halt time and building new satellite terminals to decongest busy terminals were some of the suggestions that came in when asked how the timeliness to trains could be improved.